Well, Thanksgiving day comet watchers had a very interesting time as every report on whether Comet ISON survived it’s encounter with the sun seemed to contradict the previous report. Some saying it completely disintegrated, others claiming it came around intact. Updated information is still being analyzed but the picture is a little clearer. 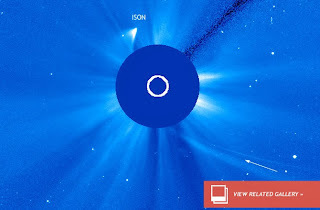 Then, in some striking images released by SoHO’s LASCO instrument (pictured top), which has a wide-angle view of the sun’s lower atmosphere (the corona), a very comet-like object appears to have survived after perihelion. The question becomes, as they note later in the article linked above… what survived? Is the nucleus still intact? “We have a whole new set of unknowns, and this ridiculous, crazy, dynamic and unpredictable object continues to amaze, astound and confuse us to no end,” said Battems. ISON has proven to be very unpredictable, with NASA admitting they couldn’t predict it even before it’s encounter with the sun, therefore no one should be surprised that it is still acting strange and not following any preset pattern from prior comets’ actions. The question now isn’t “if” ISON survived, it is what has it survived as? The MSM is catching up with Alternative Media, a day late as headlines include “scientists see tiny hope,” is now being reported at MSN, AP, ABC News etc…..
Others… see something huge coming out, as CyberTribe shows below. My question still remains….. where is the debris trail headed, how huge is it and how will it effect Earth?